We like to make all sorts of games that go with our focus book at the time. We often make games that require dice so we can have the kids practice their counting while playing a fun game. Anyone who has played a game that involves dice with a 3- or 4 year-old will truly appreciate this ingenious idea! 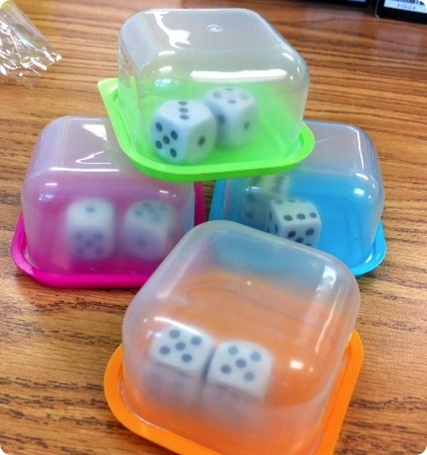 Put the dice in a little container and then the kids just need to shake the container instead of rolling the dice. No more dice everywhere but on the table! I would love to say this was my idea, but it's not. I found it on Pinterest, of course. I found these same containers at Staples in the dollar section. Let the games begin! One of the fun additions to our playground this year is our new DIY magnet wall. There is a wall at the Boston Children's Museum that my children have played with for years and I've been trying to figure out how to create something like it on our playground. Our wall is a 4 ft x8 ft piece of plywood with sheet metal glued on it. 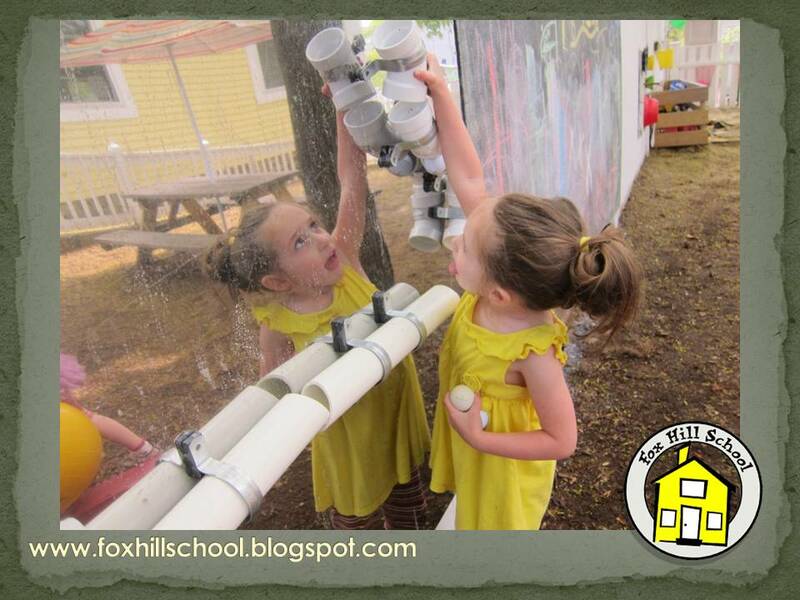 Then we made a series of PVC pipes with magnets on the back that the kids can arrange and rearrange into different configurations. They use golf balls and try to create a course for the golf balls through the tunnels on the wall! It's so fun to see the kids work together as they learn that the golf balls will only travel downwards. This activity is great for critical thinking, collaboration, spacial relations and ingenuity! 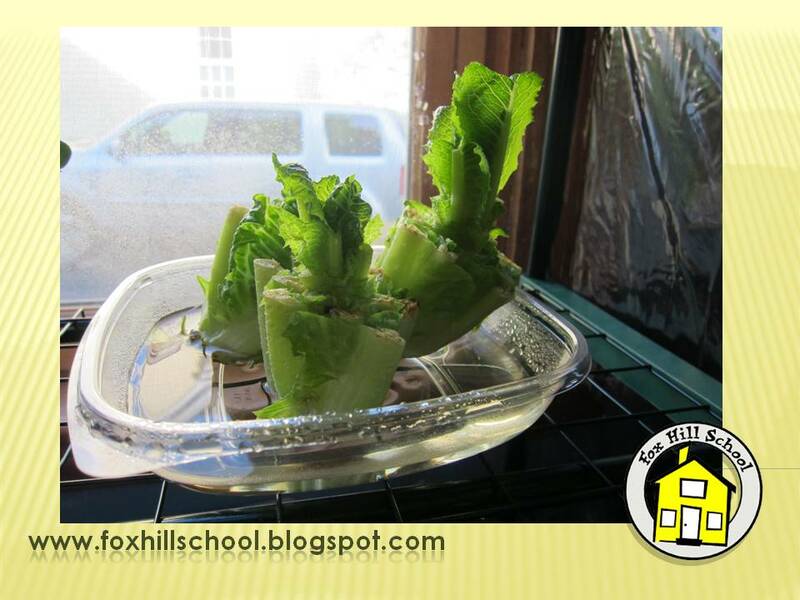 We are learning about plants in science this month at the Fox Hill School Kindergarten. Each year I have the kids plant sunflower seeds that we start inside in the mini greenhouse. Once they have grown for a few weeks we plant them in the garden before the kids leave for summer vacation so we will have a big sunflower fort in the fall when the new kids come back to school. But the other day I saw something on the Internet that I just had to try for myself. 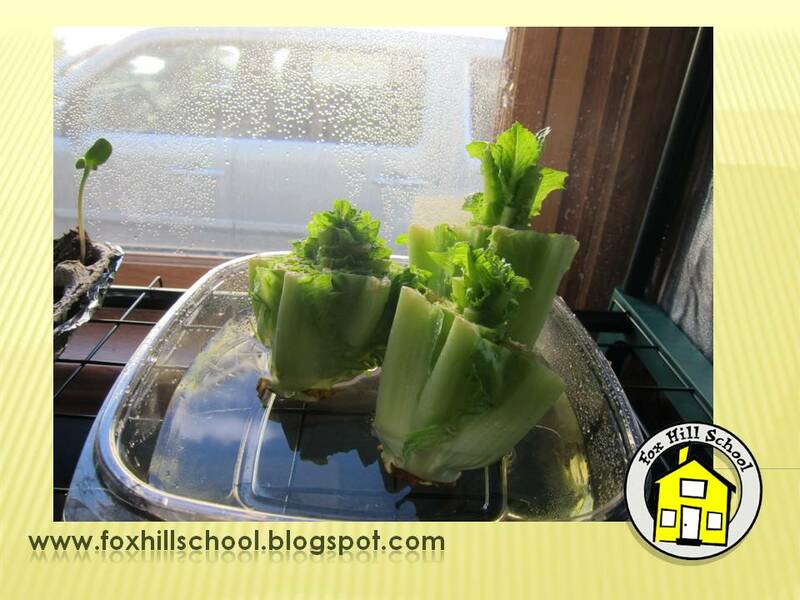 The article said that if I put the end of a head of Romaine lettuce (the part that I would usually throw away) in water, it will grow more lettuce. Humm,Let's see about that! Sunday - I had a salad for lunch and put the ends of the lettuce in water. This experiment is already good for my health! 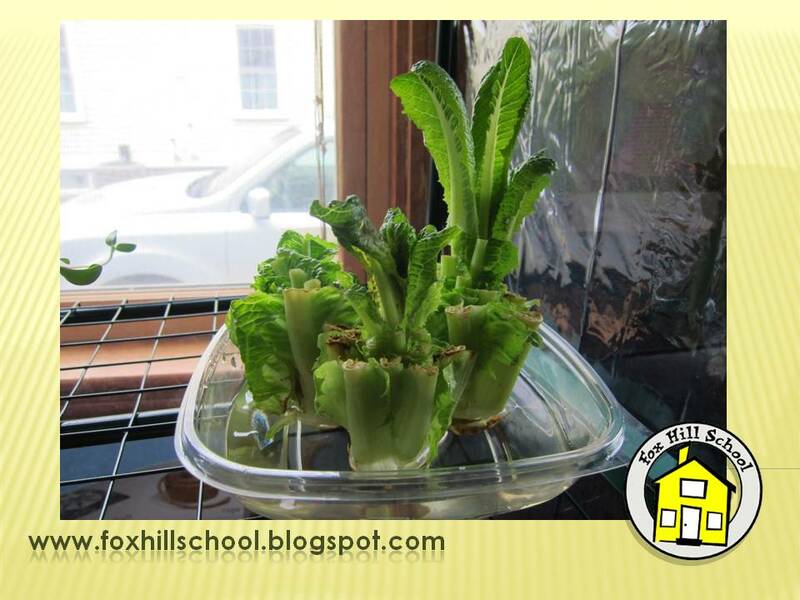 Day 1 - Monday - I looked in the mini greenhouse where I put the lettuce and look what I saw! Day 3 - Wednesday - I really couldn't believe my eyes! The lettuce was growing! The only thing I do each day is change the water in the container. That's it! Day 7 - Sunday - Kids are usually into instant gratification and now I know why! 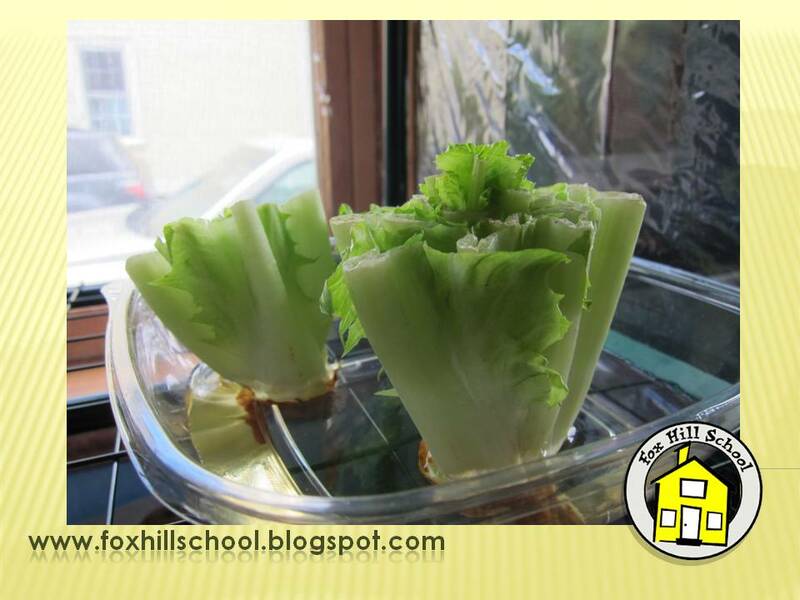 After just one week we can see the new heads of lettuce forming. Try this experiment and see for yourself. Your students (OK, and you!) will be amazed! 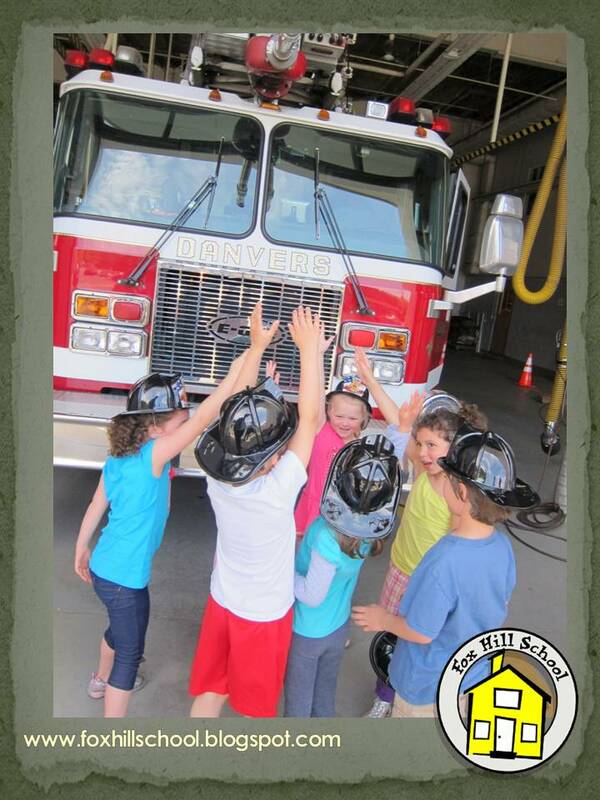 Over the years we have tried to create family events that are actually fun for the parents as well as the kids. 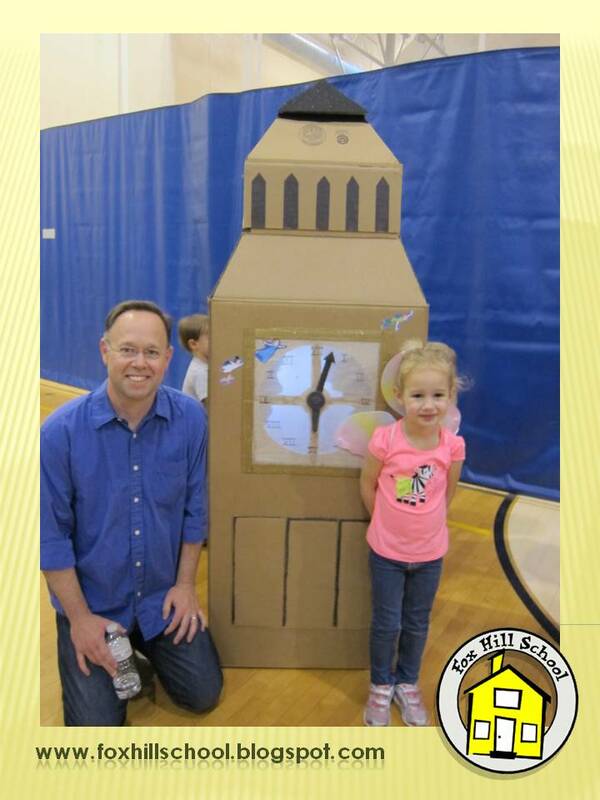 One of successes is our annual "Dad & Me Not a Box" celebration. Each year we give the kids a copy of Not a Box by Antoinette Portis (the book is available in paperback from Scholastic) and ask them to read it with their dads. Then we challenge the kids and their dads to make a creation out of a box. That is the only guideline we give them. 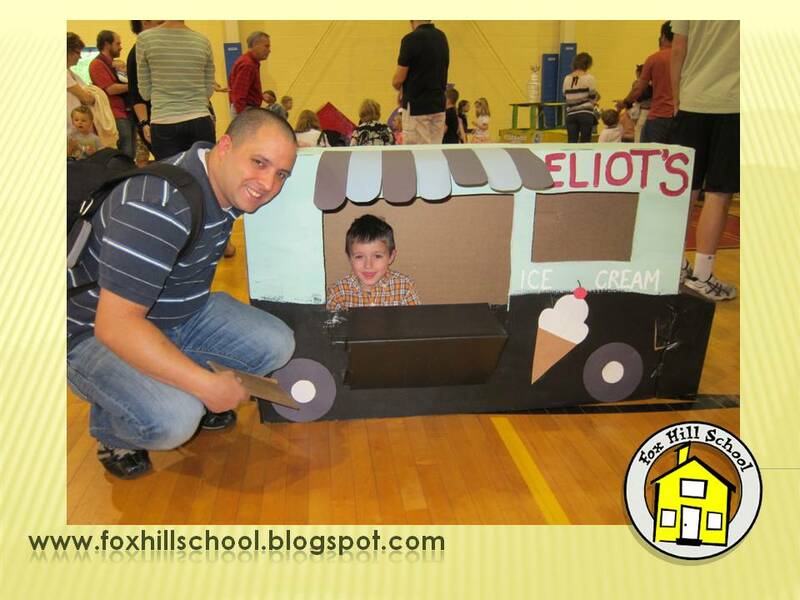 Then we have an evening event where the dads and kids can bring their box creations to put on display for the families at the school. Click on the books below to purchase from Amazon some of the books we read during our study of maps and our community! Carter Lucido, Fox Hill School alumni, is currently a 1st grader in Georgetown. He was invited to read two of his poems in front of the Georgetown School Committee last night at Town Hall and it was also on TV. This is one of the poems he wrote and recited in front of the school committee. I am so proud and touched I wanted to share it with everyone. The giant sandbox is one of the busiest areas on our playground. Sometimes we will bury "treasures" in the sand and see how long it takes the kids to find them. The treasures might be shells, fancy rocks, Hot Wheels, or other little trinkets. In addition, we always have shovels, sifters, rakes and sand molds in the sand box. In the past, all of the sand toys could be a little overwhelming at clean up time. If the toys do not have an obvious, organized place to be stored, the kids will just leave them out for us to clean up. Since we are always encouraging independence in the kids and consideration for our classroom (indoor or out! ), we felt it was important to have an easy system the kids could use to store the sand toys themselves. 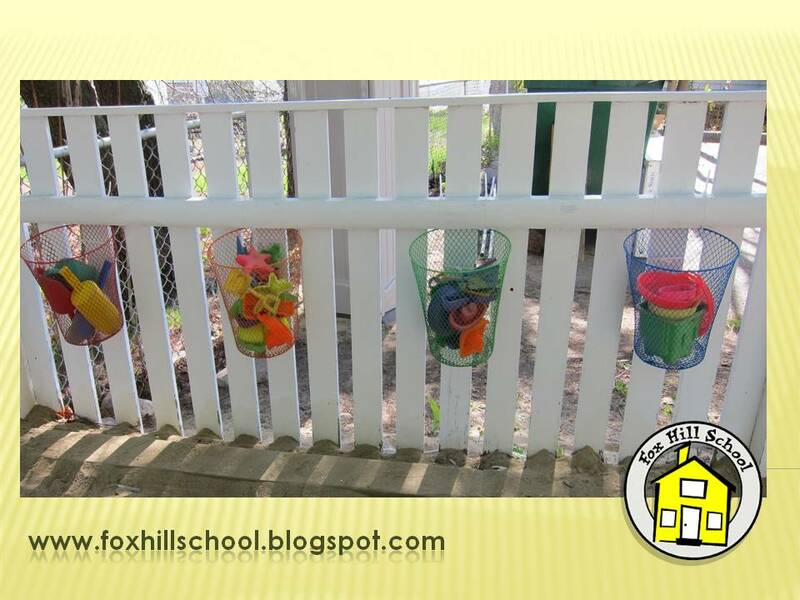 I found these colored wire baskets at the dollar store and attached them to the fence next to the sand box with zip ties. Now the kids have a convenient and fun place to put the sand toys when they are finished using them! 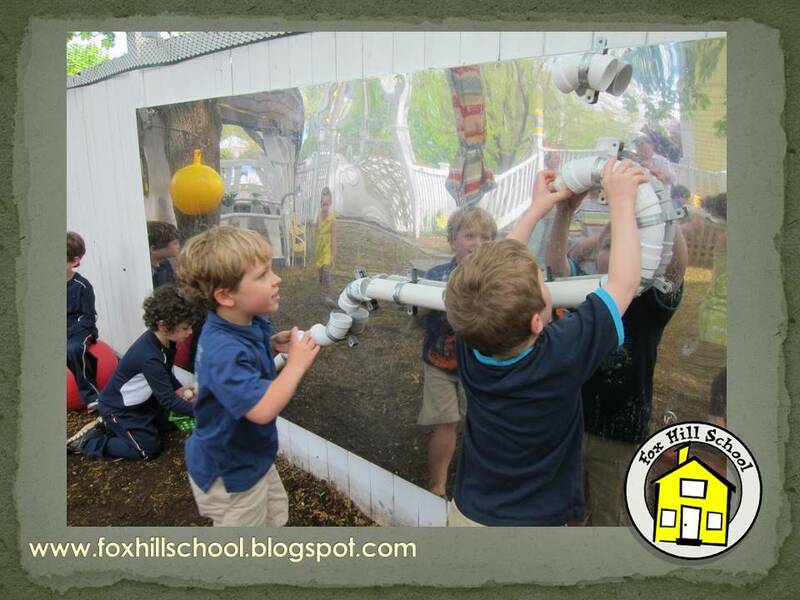 At the Fox Hill School we don't just view our play yard as a place for kids to let off steam. We see it as an outdoor classroom: a place where kids can explore, learn and have fun during their recess time. This week we'll be focusing on some of the new activities we have in our "outdoor classroom" that the parents helped us create/renew on Parent Playground Day! Up until now we have had outdoor easels in our play yard as seen in this link. The kids loved being able to paint outside, but we found that we would hang up the paintings to dry outside and they would be forgotten. So one of the things we have used to replace the easels is an outdoor chalkboard. As you may know, typical chalkboard paint is not waterproof so we had to do a little research to find a solution. Leave it to Martha Stewart to figure out how to make waterproof chalkboard paint! We are fortunate to have a Home Depot in our neighborhood and they donated the supplies for this project (thank you Home Depot!). We started with a 4 ft. by 8 ft. piece of plywood and used Martha's paint to cover all sides. 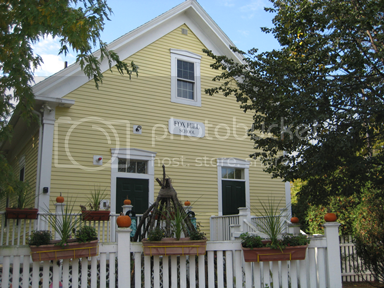 We used 1 cup outdoor paint (tinted black) mixed with 2 tablespoons of grout to make the chalkboard paint. Once it was dry we screwed it into the fence in our play yard and voila! - outdoor chalkboard! 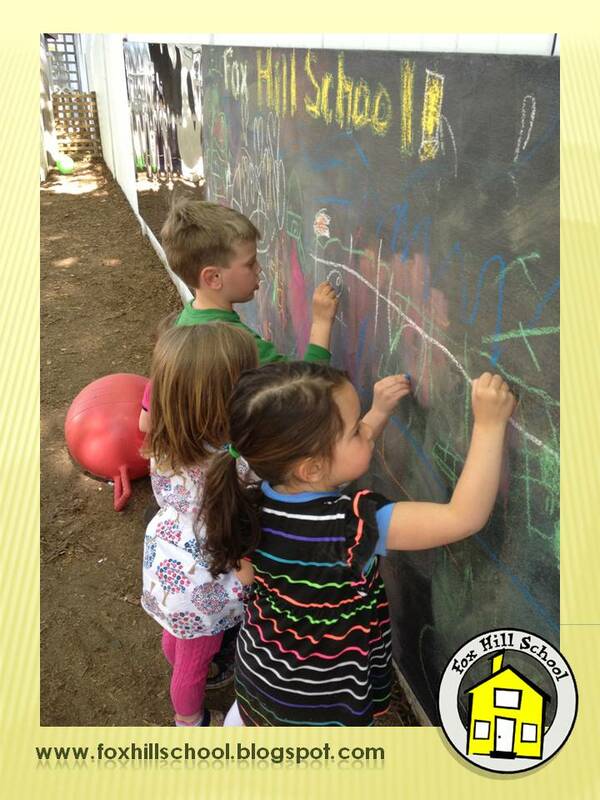 Chalkboards encourage, literacy, art, and fine motor skills just to name a few! Very easy addition to a school yard or back yard!